On each turn, a player has two options: a) split a collective of animals into two groups and take a food crate, or b) take one of the animal collectives into their ark by paying a food crate for each animal in that group. As players choose their group of animals, they drop out of the turn. The first player to drop out of a turn starts the next turn. 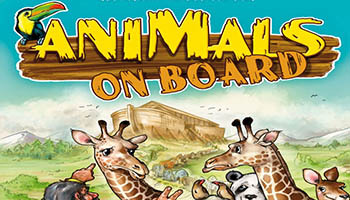 The game ends when an ark has at least ten animals on board. Each player has his own ark and wants to take as many animals on board as he can. Unfortunately, some guy called Noah claims all animal pairs for himself and has obtained an anti-pairing law. Therefore, any animal that a player has exactly twice on board at the end of the game must be discarded. However, you can circumvent the law if you manage to gather three, four or even five animals of a species.